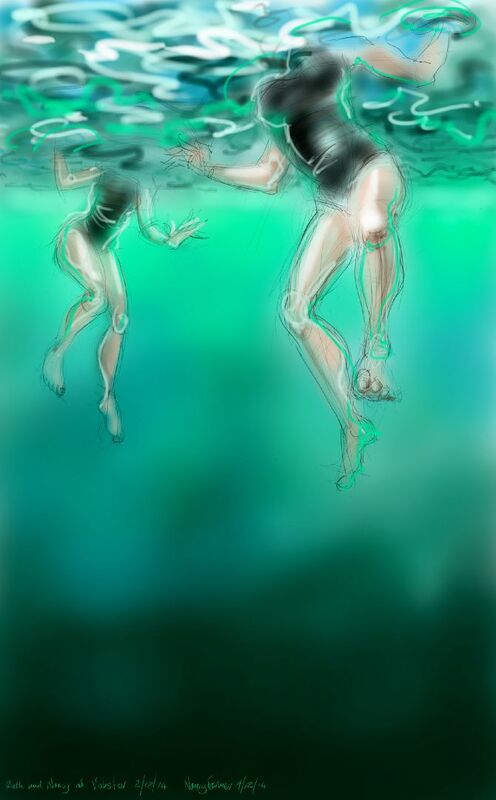 Here are Ruth and I… and before you ask, yes I made it up, I have no idea what we actually looked like but I was inspired to draw this because when I look down I am always struck by the look of remarkably pale legs reaching into the greeny-black gloom of a 40metre deep lake. I failed to capture this effect in the end, but still, some sort of drawing seemed to be required to mark the passage into December and us still in our swimsuits. Today the temperature had dropped below 10 degrees. Apologies to Jim who was there and didn’t get into the picture – he didn’t have pale legs that would have showed up, though, he had black rubber-clad ones! Some might call this sensible. This entry was posted in People, swimming and tagged art, cold water swimming, digital sketch, drawing, imaginary drawing, open water swimming, self-portrait, sketch, swimming, Vobster Quay on December 9, 2014 by Nancy Farmer.